The following list is in no way complete, but will hopefully be corrected and updated with your help (if any of you has information on something that's missing here, please share it with me, so that this page can be as correct and as complete as possible!). It is meant to give you an insight into the many aspects of the career of Tim Russ, a man most of you will primarily know as an actor. While that's basically true he also has some other talents and interests in the entertainment industry you may not be aware of. This list serves as an introduction to all these facets of a truly "fascinating" artist. Tim Russ graduated from Saint Edwards University, with a B.S. in Theater Arts and continued his studies at Illinois State University. He got his first acting job while still in University (Masterpiece Theater), and after a few years as part-time actor he began to make a living as an actor in 1985. Since then he's been working regularly on stage, in feature films and on TV. He has also done some voice-over work. A selected list of his credits will show you his wide range in all these media. Fire with Fire (1986) as "Jerry"
Crossroads (1986) as "Robert Johnson"
Death Wish IV: The Crackdown (1987): as "Jesse"
Eve of Destruction (1991) as "Carter"
Mr. Saturday Night (1992) as "A.D."
Night Eyes II (1992) as "Jesse Younger"
Dead Connection (1994) AKA "Final Combination" as "Detective Chuck Rowland"
Star Trek Generations (1994) as "Enterprise-B Lieutenant"
The Cabinet of Dr. Caligari (2004/5) as "The Clerk"
Unbeatable Harold (2004/5) as "Diner manager"
Live Free or Die Hard (2007) as "Chuck Summers"
Greyscale (2008) as "Gavin Calhoun"
The Highwayman (Mar.-May 1988) as "D.C. Montana"
The People Next Door (Sept.-Oct. 1989) as "The Answering Machine Guy"
Star Trek Voyager (1995-2001) as "Security Chief Tuvok"
Samantha Who (previously known as Sam I Am or Samantha Be Good) (2007-) as "Frank"
General Hospital (2006) as "Dr. Trent"
Twenty Good Years (2006) as "Marty"
iCarly (2007) as "School Principal"
Trust Me (2009) as "Gordon Benedict"
Masterpiece Theater (1977) "Charlie Smith and the Fritter Tree" as "a young friend of Charlie's"
Hunter (10/26/1985) "Killer in the Halloween Mask" (episode # 2.5), as "Sam"
The New Twilight Zone (1985) ep.3/c "Kentucky Rye" as "Police Officer"
Steven Spielberg's Amazing Stories (1986) "You Gotta Believe Me" as "Security Guard #1"
Vietnam War Story (?) episode "The Mine" as "Sgt. Lemon"
Starman (1/9/87) ep. 12 "The System" as "Tyrone Washington"
Hill Street Blues (3/31/1987) ep. 7.19 "Days of Swine and Roses" as "Ben Childers"
The New Twilight Zone (1987) ep. 34/b "Voices in the Earth" as "Archer"
Jake and the Fat Man (1987) "Brother, Can You Spare A Dime?" as "Pete"
Thirtysomething (1987) premiere episode as "the guy who sold the sleeping bag"
Police Story (1988) "The Cop Killers"
21 Jump Street (1988) "Slippin' Into Darkness"
Alien Nation (1989) pilot movie, as "Ketnes"
Beauty and the Beast (1989) "Sticks and Stones" as "Lt. Parker"
Mancuso, F.B.I. (1990) "Conspiracy" as "Rashad"
Freddy's Nightmares (1990) "Dust to Dust" as "Dr. Herny Picard"
Cop Rock (1990) ep "Marital Blitz" (1.9) and "No Noose is Good Noose" (1.10), as "Juror"
Family Matters (1990) "Sitting Pretty" as "Jeff"
The Fresh Prince of Bel-Air (1990)"Someday Your Prince Will Be in Effect" as "Eugene the security guard"
The Fresh Prince of Bel-Air (1992) "Those Were the Days" as "FBI agent Marcus Collins"
Tequila & Bonetti (1992) "The Rose Cadillac" as "Link, the car thief"
Murphy Brown (1993) "The Egg & I" as "Agent #1"
Living Single (1993) "Burglar in the House" as " Officer Taylor"
Seaquest DSV (1993) "Photon Bullet" as Martin Clemens aka "Mycroft"
ST-TNG (1993) "Starship Mine" as "Devor"
Hangin' with Mr. Cooper (1993) "Seoul Shake" as "Victor"
Hangin' with Mr. Cooper (1994) "Wedding Bell Blues" as "Victor"
Melrose Place (1994) "It's a Bad World After All" as "a guy working for the District Attorney"
Monty (1994) pilot as "Man #1"
Who Gets the Friends? (1988) as a "travel agent"
Roots - the Gift (1988) as "House slave Marcellus"
Dead Silence (1991) (aka as "Crash") as "Dep. Ryan"
The Heroes of Desert Storm (1992) (aka "Heroes of the Storm") as "Julian Crumes, Navy"
Bitter Vengeance (1994) as "Lt. James"
Spider-Man (animated) (1997) "Partners in Danger: Part 11: The Prowler"; as "Prowler/Hobie Brown"
Star Trek: Voyager "Elite Force" (2000), voice of Tuvok, Activision, Raven software. 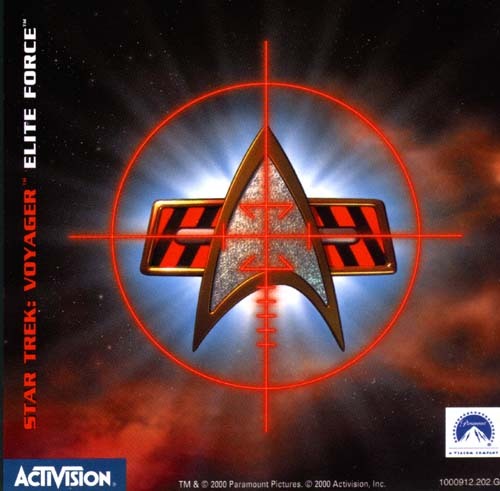 "Elite Force II" (2003), voice of Tuvok, Activision, Raven software. "Fahrenheit 452: The Art Police" (2000): 7 episodes, as "Mike"
"Roddenberry on Patrol" (2003), as "Red shirt bandit"
The Heartbreak Café (2001) Episode #37, "Decisions, Decisions"
Psychic Investigators (2002): this is a pilot presentation which has not been sold yet. "Mind Games" (2003), short movie, not available yet. "The Routine" (2003), short movie, not available yet. The Heartbreak Café (2005) Episode "Writer's Block"
Lou Anders, review of tape 4.12 in "Star Trek Monthly" #47, Dec. '98: "Brilliantly directed by regular cast member Tim Russ, Living Witness twists and turns to a final, unpredictable resolution that is sure to delight fans." "Fahrenheit 452: The Art Police": Among other things, Tim has co-director credit for the comedy short mini-series. Tim Russ recently started another career as producer of independent films. His first work in that regard, a thought-provoking drama, was a collaboration with a colleague from University, Nate Thomas. "East of Hope Street" (1996) independent movie, directed by Nate Thomas, script co-written by Nate Thomas and Tim Russ. A true story about a young Hispanic girl from El Salvador, who finds herself in an out-of-headlines urban drama, wherein she must learn to survive the inner city, a foster home, and a social system in a Los Angeles, most of us have never seen. Awards: Best Urban Drama (Film Festival in New York), successful at the Louisiana Film Festival, First Place in the Cross Cultural Category at the Black Film Makers Hall of Fame in Oakland It also screened at the Latino Film Festival in Universal Studios and Paramount Theatres venues, where it was introduced by no less than Edward James Olmos! Academy Winner Gregory Nava said after seeing the film: "If blacks and Latinos would stick together, we'd make a better place to live." 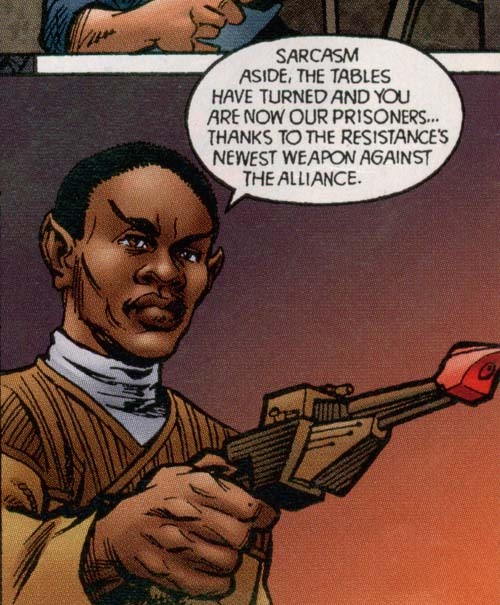 (information quoted from "The Vulcan Insider", Winter 1998-issue, the newsletter of Tim Russ' official fanclub). "Fahrenheit 452: The Art Police" (2000): press release on this comedy- short mini-series used to be found at http://www.galaxy.tv/free/art_police/art_police.html, but Galaxytv as a whole seems to be offline right now. Maybe they are re-designing. Tim is credited as creator, producer, writer, director and star. He shares all these credits with his co-stars, Bruce A. Young (The Sentinel) and Dan Chase (East of Hope Street). 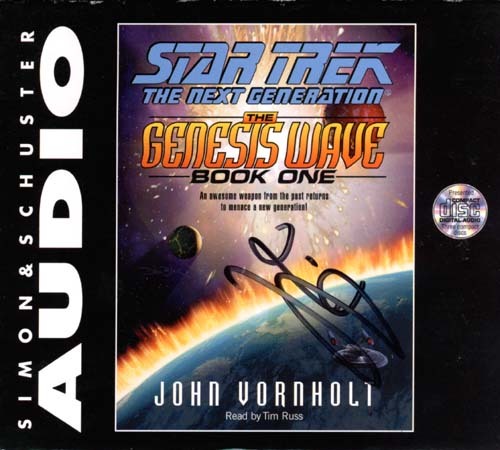 The music was written and performed by Bill Burchell and Neil Norman. 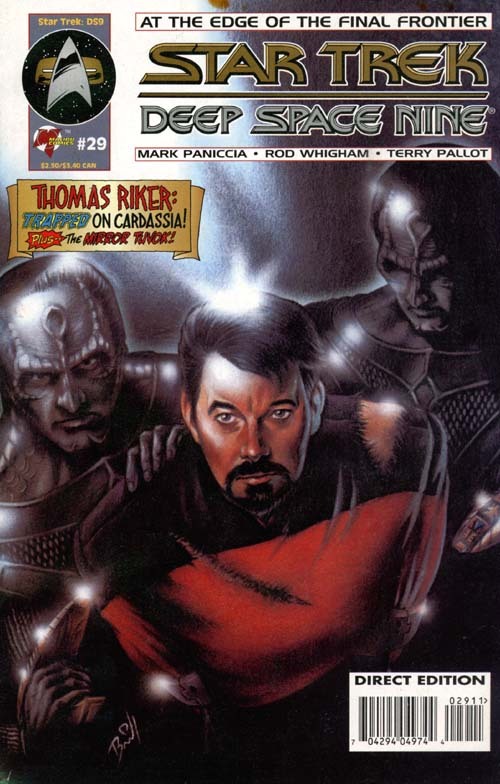 Originally the series was supposed to run for 24 episodes, but was cut short when galaxyonline.com changed ownership. So only 7 episodes were produced and are up on the galaxy.tv-page - assuming your internet connection is fast enough and assuming the link works, which it does not always do. "Bugsters!" 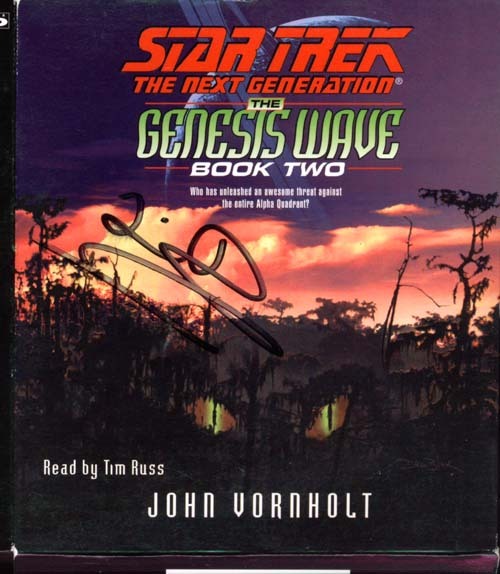 (2001): an audio book for young children, written, produced and performed by Tim Russ and Jedda Roskilly. 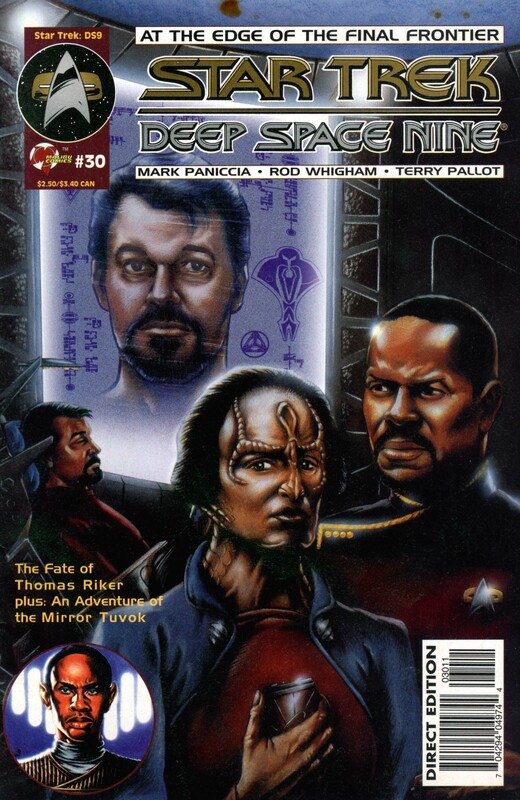 Narrator: Jedda Roskilly, characters: Tim Russ, Ethan Phillips, Chase Masterson and Jedda Roskilly. Music by Bill Burchell. "Kushangaza" (2001): Tim also produced his latest CD himself, together with Bill Burchell from "The Cosmic Orchestra"
"Bugsters Tunes & Tales" (2004): A new release of "Bugsters!" with nine all new original songs, five of them also in an instrumental version. Tim wrote the songs, performed them and produced the new CD. "...2nd Thoughts" (2007): the new songs for this CD were also produced by Tim. 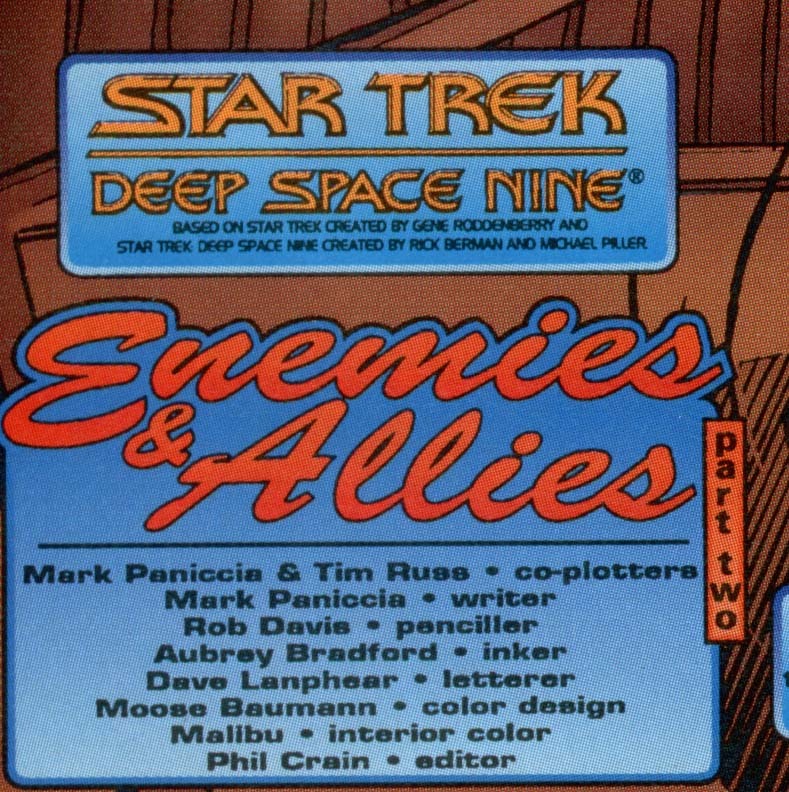 Covers of #29 and #30, plus the first page of part 2 with Tim's credit (click on thumbnails to see the whole picture!). 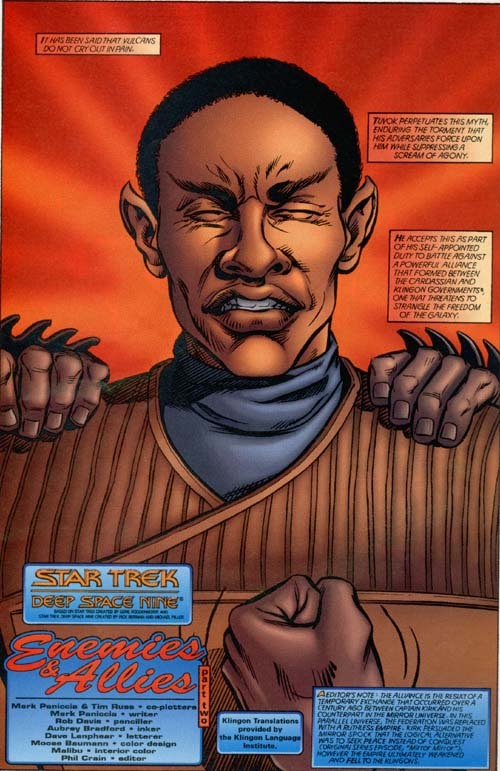 The Mirror-Tuvok is brave, as you can see, but he is also right-handed! Tim also wrote the lyrics for all the Bug-songs on "Bugsters Tunes & Tales", though he shares writing credits for the lyrics of "Camouflage" with his girlfriend Jedda Roskilly. What else is there to say - except: if you get a chance to catch one of his performances, do it! He is *fantastic*! 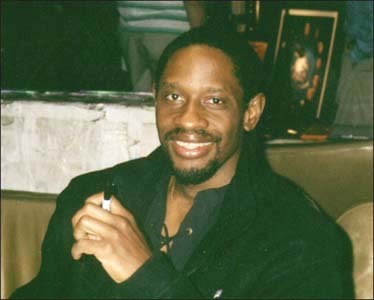 Tim Russ played the guitar himself in "Crossroads"
He sang and danced in the Broadway production of "Dream Girls"
"Kushangaza" (2001) produced by Tim Russ and Bill Burchell, performed by Tim Russ (rhythm guitar, acoustic guitar, lead vocals), Neil Norman (lead guitar), Bill Burchell (keyboards) and Kevin Karamitros (drums and percussion on "Kushangaza"). UPC 698731-00020-0, TR/84 Music. Dedicated: "To my daughter Maddy, with love". "Brave New World" produced by Tim Russ and Bill Burchell, performed by Tim Russ (rhythm guitar, lead guitar, acoustic guitar and vocals) and Bill Burchell (keyboards & sequencing). Dedicated "To Jedda, Maddy, and my family with love". The new release of "Bugsters", also contains several Bug-songs, most of which are performed by Tim. "...2nd Thoughts" produced by Neil Norman, Tim Russ and Bill Burchell, dedicated "To my family with love". There is also a chance to download the songs (so far both newer albums, "Tim Russ" and "Kushangaza", are available) as mp3s from http://www.emusic.com, by becoming a member.